The new ultra-high performance, fully integrated and calibrated Dual Channel Airborne Mapping System RIEGL VQ-1560i makes use of RIEGL's sophisticated Waveform-LiDAR technology enabling an excellent multiple-target detection capability and Multiple-Time-Around (MTA) processing. The system is capable of online waveform processing as well as full or smart waveform recording, resulting in unsurpassed information content on each single target. The new VQ-1560i provides a laser pulse repetition rate of up to 2 MHz resulting in more than 1.3 million measurements per second on the ground and operates at an altitude of up to 15,500 ft. That allows operation at varying flight altitudes resulting in a wide range of point densities. Thus, the system is ideally suited for aerial survey of ultra-wide areas as well as of complex urban environments. By the way, faster and more efficient flight planning and safer flights are enabled. 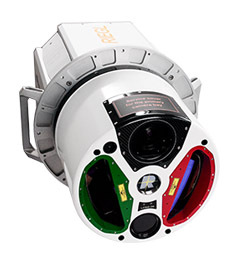 The NEW sister type RIEGL VQ-1560i-DW offers two LiDAR channels of different wavelengths, green and infrared (IR). These wavelengths are well chosen to allow the acquisition of scan data of complementary information content, thus delivering two independent reflectance distribution maps, one per laser wavelength. The RIEGL VQ-1560i comes with a unique and innovative forward/backward scan angle. This enables capturing data from multiple angles more effectively and more accurately at high point density. With its large field of view of 58 degrees and its widely variable scan parameters the system enables highly efficient scan data acquisition. The system is equipped with a seamlessly integrated high performance IMU/GNSS system and optional a 100 megapixels RGB camera as well as another camera, e.g. a thermal camera or a 100 megapixel near-infrared camera. All individual components are integrated into a compact design and equipped with a mounting flange for simple interfacing with typical hatches or gyro-stabilized leveling mounts.